Thank you all for your prayers for our family as we traveled back to the US. The kids did great on the long flight back. Just a few days after our arrival, we were off on a road trip with family. We traveled from Delaware to Florida and spent a week in Disney World with Allen’s dad, and his two brothers and their families. 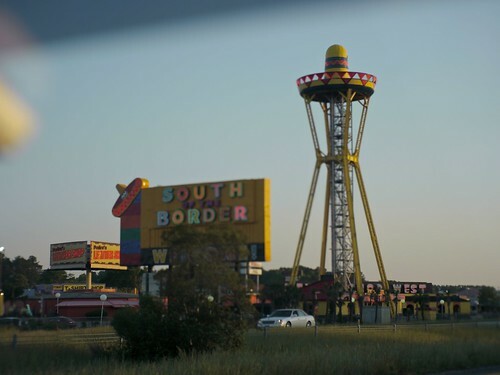 Above: It was a two day road trip with plenty of stops for the kids to get some needed exercise after being cramped in the car. 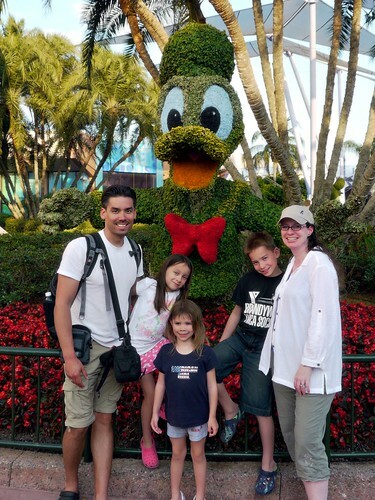 We had a great time at Disney with family. For those of you who were praying for Kira’s broken collar bone to heal up, she was feeling better by the time we got to Disney. She was able to ride on all the rides with no problems and God even protected her when she slipped and fell one of the days at Disney. 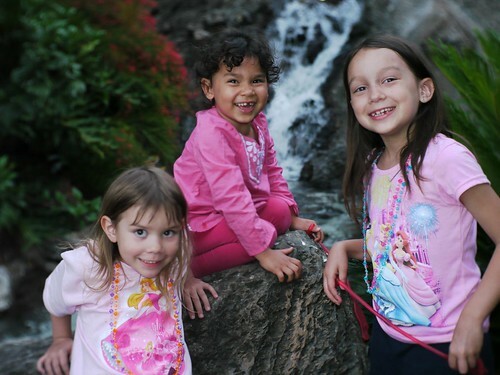 Above: Kira and Ellie with cousin Scarlet. Above: Uncle Sam with his son Matthew. Above: On the way back from Florida we stopped by the Sommers who served with us in Hungary year’s ago. 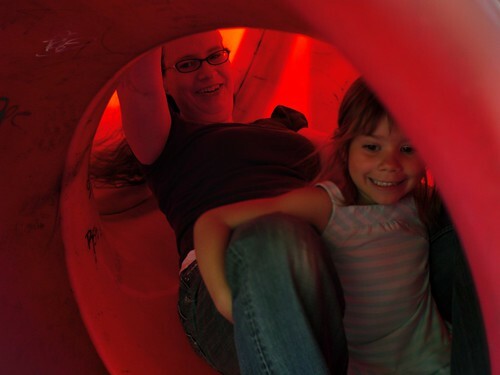 We were thankful that our kids could re-connect and pick up where they left off years ago. Above: Gotta love their new dog Rosy with her radar ears. 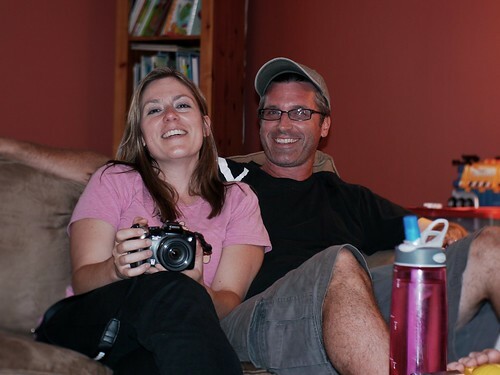 After a marathon of traveling, we finally were able to truly unpack at Matt and Karen’s house in Delaware. They have been gracious to allow us to stay in their house while we are on home assignment. 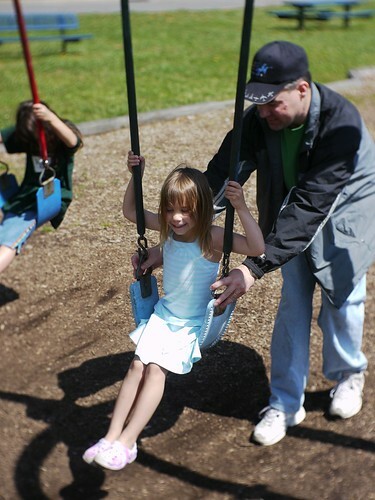 Above: Matt helping Kira on the swings at a nearby playgound. 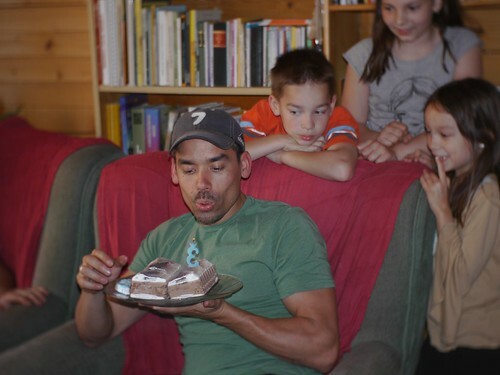 Above: Once we were back in Delaware, we celebrated Kira’s fifth birthday! Above: Heidi just a few days before giving birth to her second child, Samuel Henry. We are rejoicing with our teammates Roger and Heidi for the gift of another child. 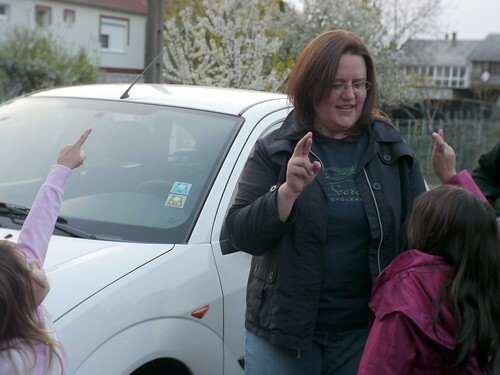 Above: Heidi’s parents made the long trip out to Hungary to help in this time of transition for their family. Above: Hungarian teammate Miki’s daughter Anna was taken to the emergency room just days ago for appendicitis. Miki tells me that he is thankful that the surgery went well and that Anna should be released from the hospital soon. Please pray for Anna’s complete healing, for comfort and for the needed rest she needs to fully recover. • Kira’s collar bone is much better! • We saw our baby’s heartbeat today at a general examination. Praise God for our child’s healthy progress. • We made it to the US with no complications (all luggage and all Mercers in tact). We also traveled to and from Florida (a very long trip) with no complications. Praise God! • Praise God for the car he has provided for us to use while at home and for the house Matt and Karen have graciously provided for us to stay in these next few weeks. • Please pray for Anna’s full recovery from surgery. 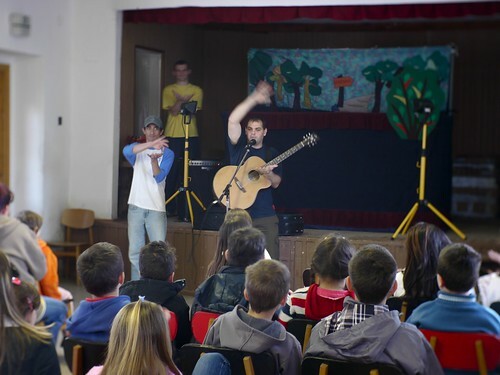 • Teens from our church in Hungary will be attending a conference this weekend. Please pray that each would be built up through God’s word and have a greater sense of His will for them. • Allen and Kira have been suffering from the pollen in Delaware’s air. Please pray for healing. 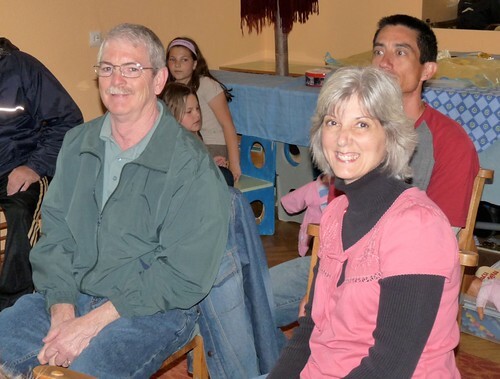 • We have already met with a few small groups to share how God has been at work in Hungary. 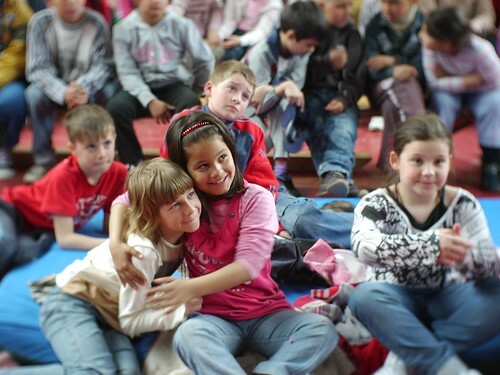 Please pray for God to provide the monthly support we need before we can return to Hungary in mid June. 18 Then those also who have fallen asleep in Christ have perished. 19 If in this life only we have hoped in Christ, we are of all people most to be pitied. 55“O death, where is your victory? O death, where is your sting?” 56 The sting of death is sin, and the power of sin is the law. 57 But thanks be to God, who gives us the victory through our Lord Jesus Christ. — Thank You Lord Jesus for swallowing up death, for removing it’s power to threaten and torment me. You went through death in order to destroy “the one who has power of death, that is the devil and deliver all those who through fear of death were subject to lifelong slavery. ” (Heb 2:14-15). You are my Redeemer, saving me from the slavery of fearing death. You have unmatched might. For who else in history has taken on death and won? Who is like You, my Lord? Above: Tamás giving testimony about his first experience fasting (as our church was corporately fasting over the past two weeks). He spoke about how things actually seemed to get worse we he began as he had to take his child to the hospital related to serious symptoms. 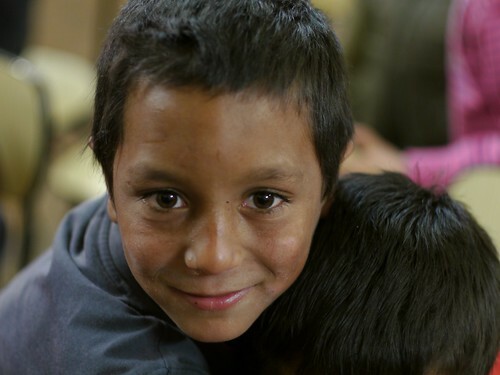 Tamás continued to pray and God was gracious to bring healing to his child. Tamás shared that throughout his time of fasting he had a deep desire that his brother would be saved. 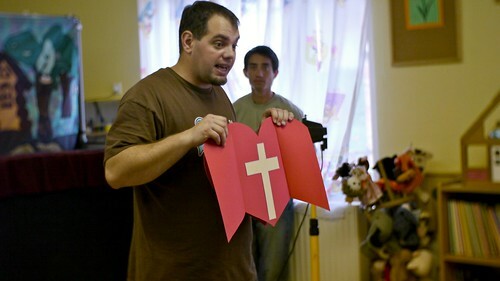 At the same time, Tamás admited that his faith was weak and he really couldn’t even imagine his brother knowing Jesus. At the end of the week, Tamás got a phone call from his brother. Tamás told his brother about Jesus healing his child and his brother replied, “Thats great Tamás. Guess what, I’m going to church now.” May the Lord continue to use Tamás as a witness in his family and may his family come to know Jesus as their personal Lord and Savior! 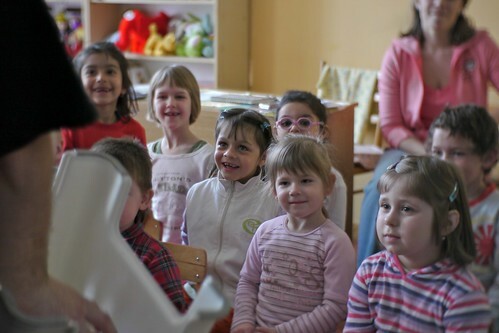 Above: Miki’s wife Erika teaching Sunday School. 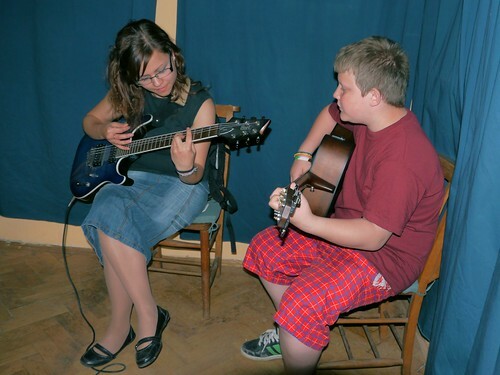 Above: Eszti with her little brother GyÅ‘zÅ‘. 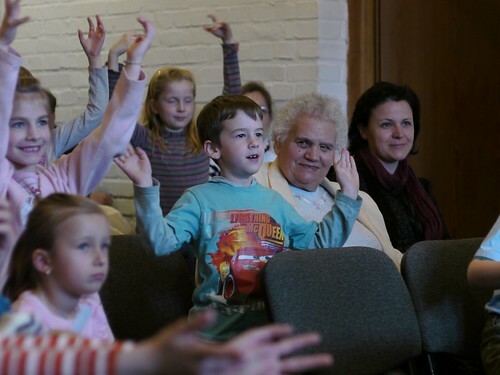 Eszti has been learning to play guitar and piano recently and was able to play last week for the first time in church. 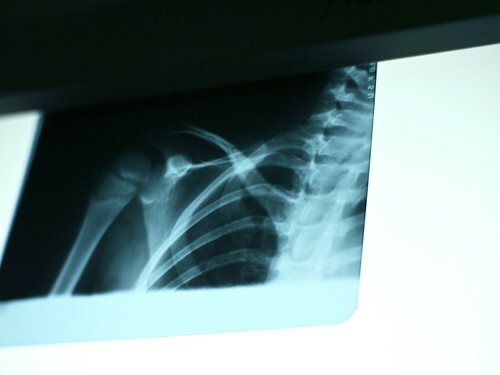 Above: Kira’s collar bone continues to heal. She is sleeping well at night and seems to have more mobility with her arm. Please continue to pray for complete healing. 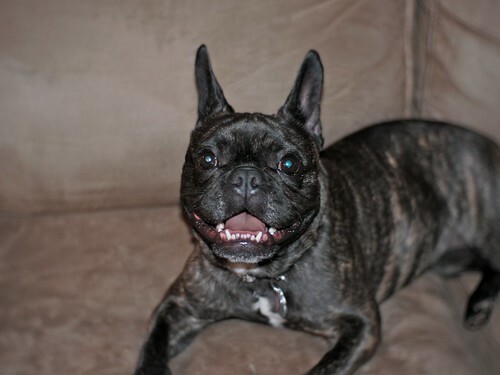 Above: Maybe this will make you feel better. 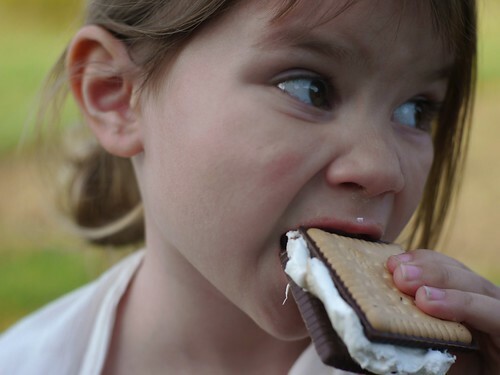 Kira enjoying a smores at a barbecue we held for the teens last week. Some of them were having smores for the first time in their lives! Above: Ben’s class had a special presentation for mothers day. They planned the presentation early knowing that Ben would be leaving for the States (wednesday). It was a special gift for Sharon and Ben even made a special card with a personal note as to why he was so thankful for her. Above: Ben saying goodbye to a few friends. 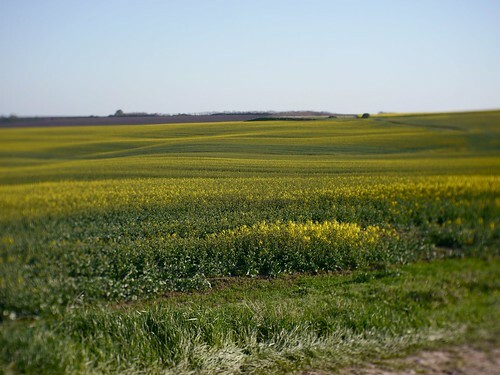 Above: Some of the beautiful fields we see on the way back from Ben’s school. • We are expecting! Sharon is 10 weeks pregnant and we have seen a healthy heartbeat at our 9 week checkup. As many of you know we have experienced 3 miscarriages. Please pray for the healthy development of this little one and for Sharon. • We are in need of new monthly supporters and even ask for you to pray for an additional supporting church. We are currently at 61% of where we need to be before we return to the field in mid June. • Our first week back will be spent with Allen's brothers and their families in Disney World! Pray for encouraging fellowship, for Kira's collar bone to be healed by then and for safety as we drive to and from Florida. 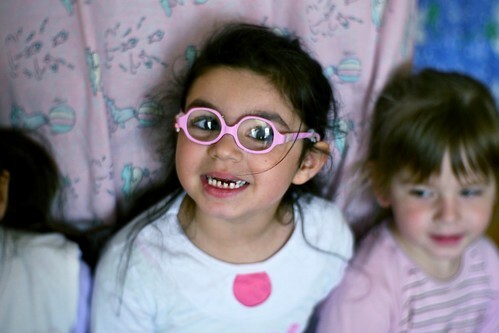 • Elianna, Kira and Allen are sick with some kind of sinus/cold/infection. Please pray for healing. Thank you all for your investment in our family's life... Many of you have been an encouraging and supportive influence before we even arrived on the field in 2000. We appreciate your love for us and look forward to seeing you face to face. 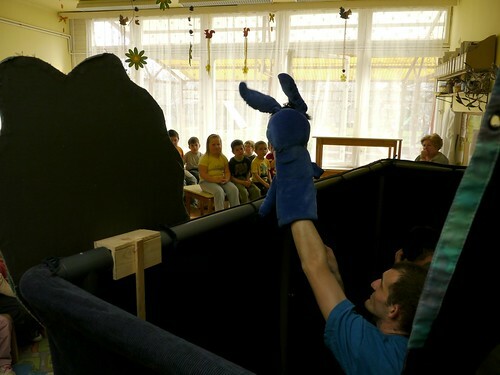 Last Saturday was our final day of Easter Puppet Ministry. God was gracious to sustain our team throughout the two weeks of traveling to 18 public schools. 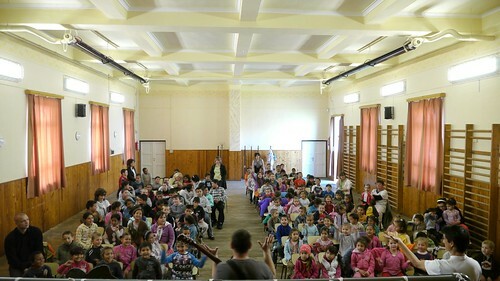 Above: Our first show in Gyöngyös was held in the town’s community center. We were thankful for the small turnout of parents and children. 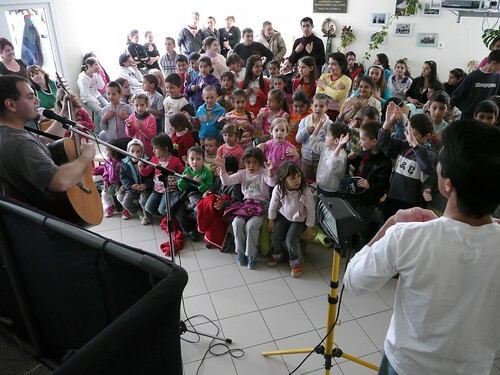 Our next stop was in the town of Vanyarc and was also held in the local community center. One of the teachers from another school (in another town) was gracious to invite us and did the work of invitation and providing a place for us to perform. We are very thankful for your prayers throughout this time and clearly saw God at work. 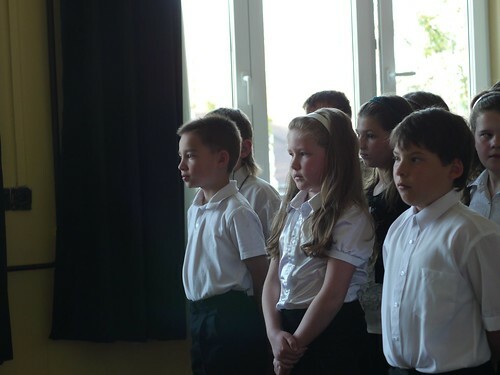 I am amazed at God’s grace in opening this door in public schools where we could teach the Easter message of the death and resurrection of Jesus Christ. 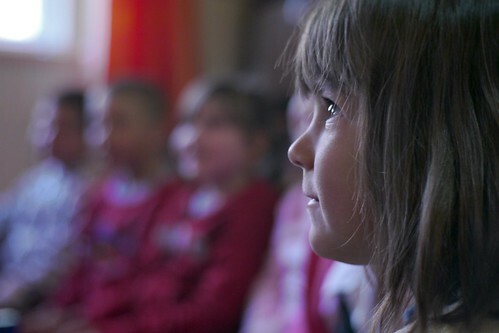 Our team was encouraged as kids from various schools shared that they often listened to CDs from years past. 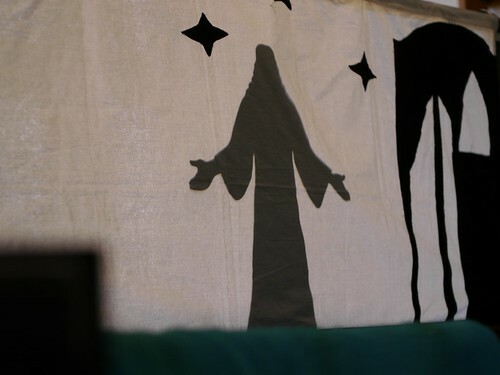 Sometimes after the show, as we finished packing and were exiting the schools we heard kids singing, “On the third day, He rose from the dead” on their own. 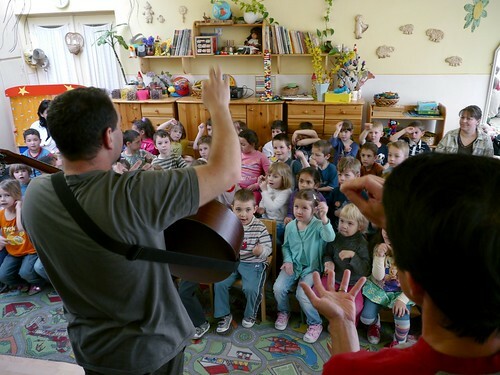 Praise God for the many seeds planted and may He grant growth in the hearts of a new generation of Hungarians, that Jesus would be glorified! Above: My last time together with the guys from Jászfényszaru before returning home of furlough (next week). 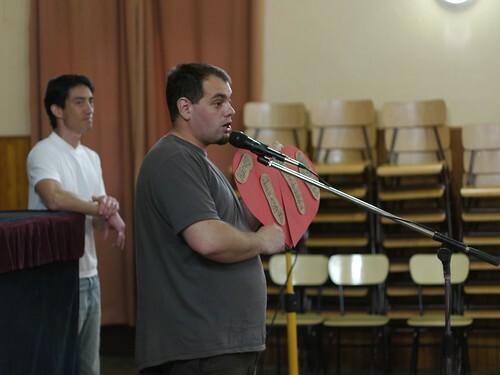 Peti (grey shirt) is a member of our church and works in a factory with most of these guys. We hope that these times together will help build long lasting friendships and lead to open doors to share the good news of salvation in Jesus. 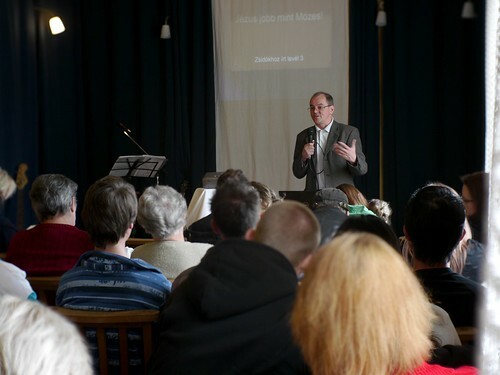 Above: DezsÅ‘ preaching on the high priority of faith in God and His promises and the problems that arise when we live without faith in His word. Above: DezsÅ‘ (center - not the baby) was privileged to dedicate Tomás and Ági’s newborn child Peti to the Lord. 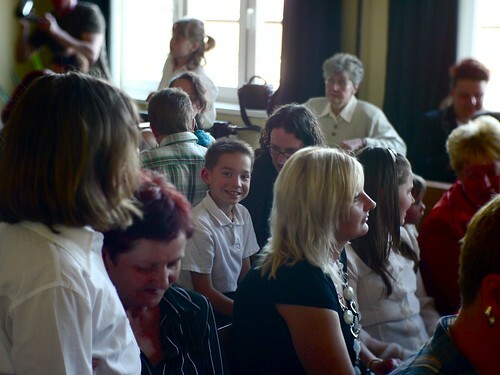 This was DezsÅ‘’s first baby dedication and he did a great job (in fear and trembling). God used DezsÅ‘ in a mighty way to introduce both Ági and Tamás to Jesus when they were about to divorce. God has done a mighty work in both of their lives and restored them through His grace. 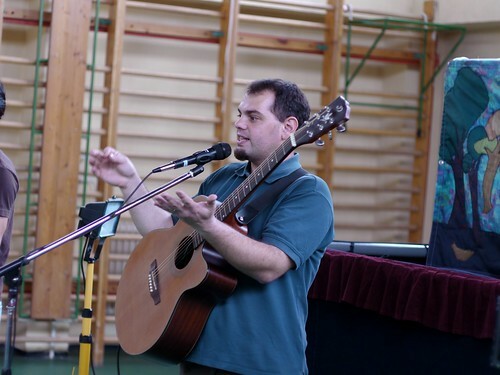 DezsÅ‘ has received more direction from God in the past few months and has become confident (along with Miki and I) that He is called to serve as an elder in our body. 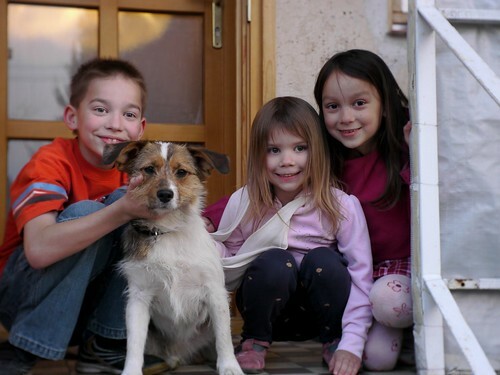 Above: Our family saying goodbye to Brenda (and her dog Lucy). Brenda will be traveling to the US for a short time to participate in her sister’s wedding. 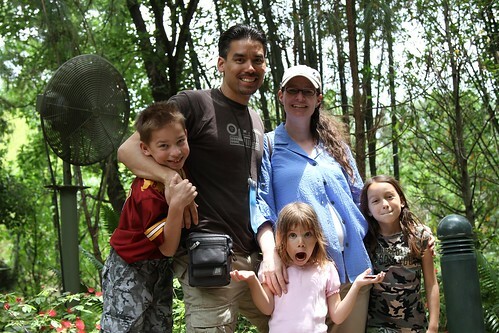 As our other teammates Roger and Heidi are expecting a baby at the end of April, and our family will be leaving for furlough next week, the American contingent of our church planting team will be ‘off the field’ for a time. 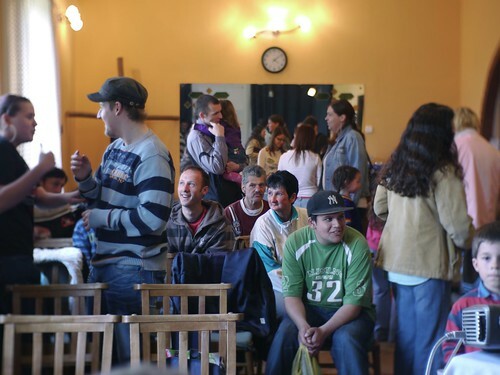 Please pray for the Hungarians who will be taking over various responsibilities to grow in their faith, to be able to serve in their giftings and to know and experience that Jesus is the One who builds the church. Above: We never expected this sports outreach to grow so quickly. I stepped back on Monday and surveyed over 18 adults from various backgrounds having a great time. As you know from past reports, this volley ball outreach has led to dinner invites and more conversation about our faith in Jesus. It has been difficult to find a forum to gather together with adults in the community, but this seems to be growing every week. Above: The kids also enjoyed being together as their parents played volleyball. Above: My team surprised me with an early birthday party after our meeting tonight. No I’m not 3, I was born in 72 (you do the math). Thanks team! 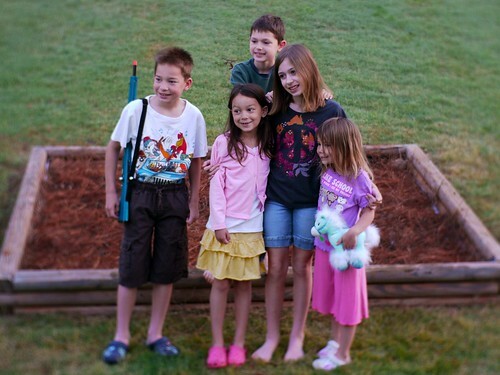 Please pray for our family as Sharon, Allen, Kira and Elianna seem to be fighting a virus. As we will be leaving for the US next week we would also appreciate prayers for wisdom and strength to complete all that needs to be done before we return. 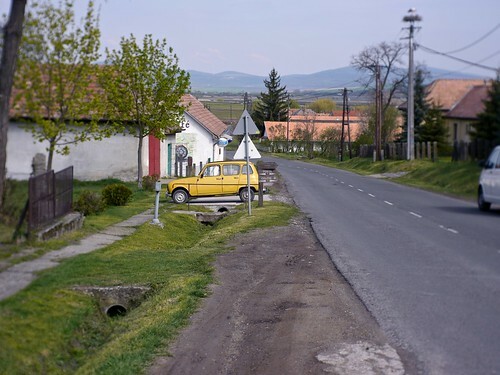 Above: Driving into the small town of Szarvasgede for today’s show. 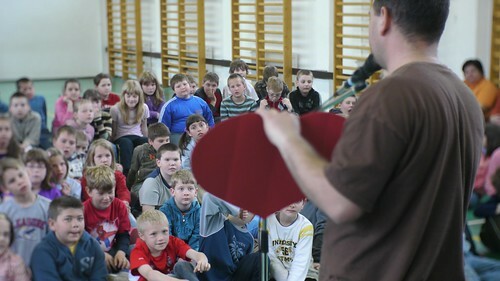 Above: After the show the kids are excited to get their own copy of the gift CD and children’s magazine. 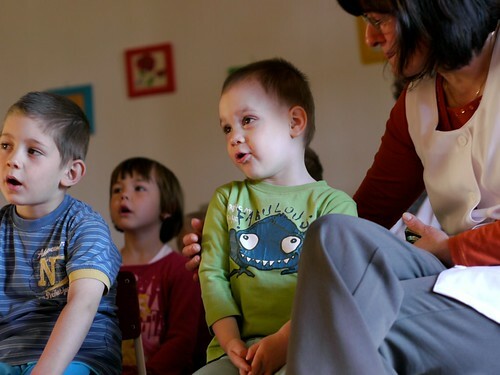 The kids in this small preschool are always a joy to be with. Most kids shuffle in after we are already set up, but this group got the extra treat of watching us assemble of plastic tubes, lights and puppet stage. 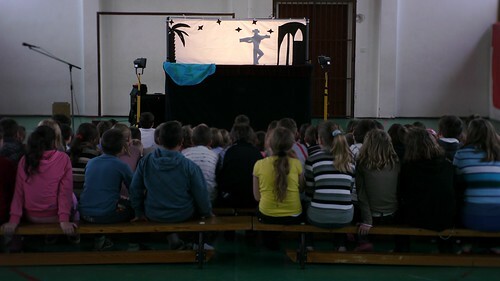 As we finished the assembly, some of the kids began saying, “This is going to be great!” God has continued to be gracious toward us as the Easter puppet show has gone smoothly in every place we visit. 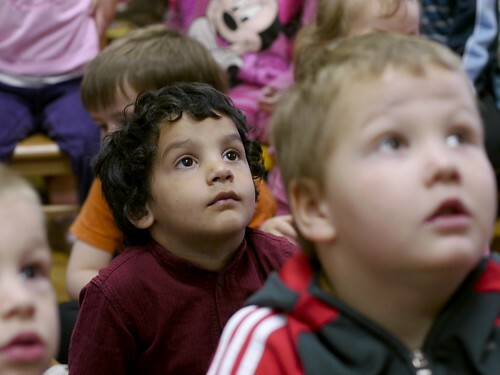 As you can see from the children’s expressions, they are completely engaged in the story, singing and teaching time. 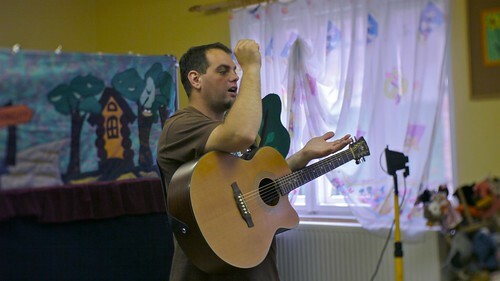 Praise God for initiating this ministry and inviting us along with you (in prayer) to be a part of this work in Hungary. 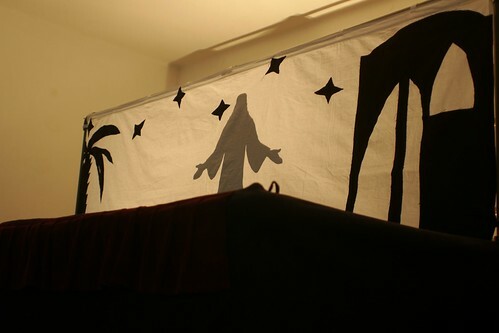 Tomorrow is our last day and we continue to ask for your prayer support as we finish this year’s Easter Puppet Ministry! Above: This was our first time serving in the town of Csécse. 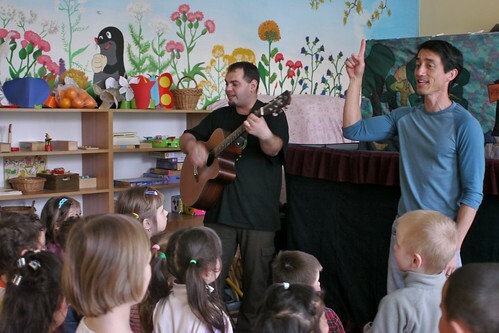 After our show the teacher pictured above right invited us for coffee and Hungarian snacks. 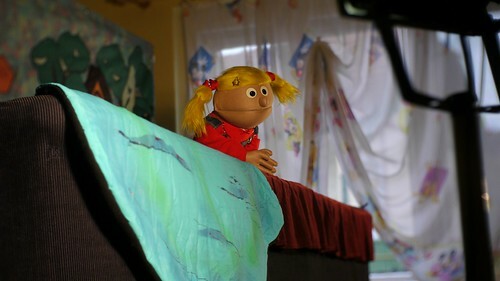 She told us how powerful the puppet show was and how it spoke not only to the kids but also to her. 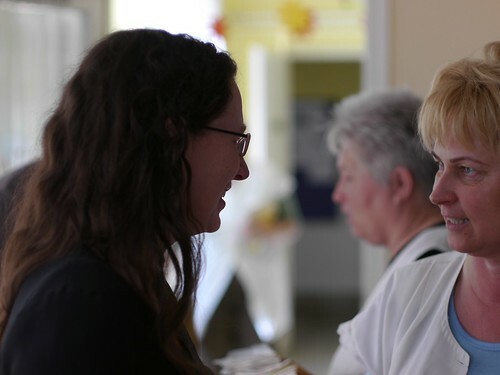 After finding out that I was American, she turned to me and asked, “So how did you end up in Hungary.” I was able to share how I came to put my faith in Jesus and how He then led me to Hungary. The teacher (above right) was very kind toward us and asked if we would be willing to come out and serve in a community event in May in Csécse. 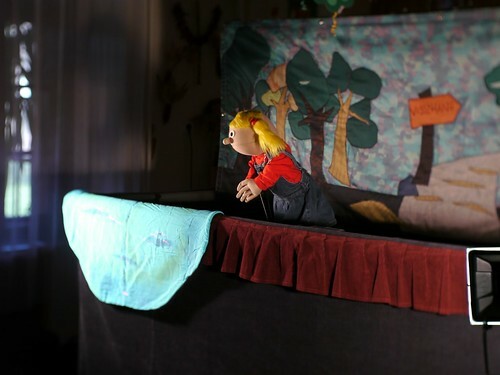 She also asked if she could tell one of her friends in a neighboring town about us in order to bring the puppet show to that town next time. 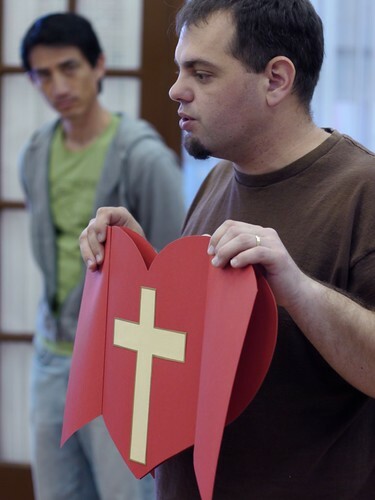 Praise God for this open door to Csécse and for this teacher becoming an advocate for us. 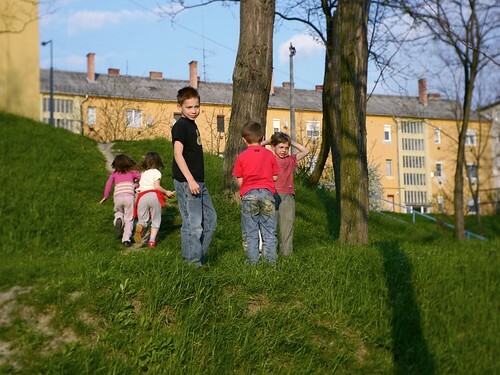 Above: Kids on the playground before our show began in Jobbágyi. Above: This girl brought her magazine from last Christmas’ puppet show! Praise God that these packets that are being distributed are held on to and read! 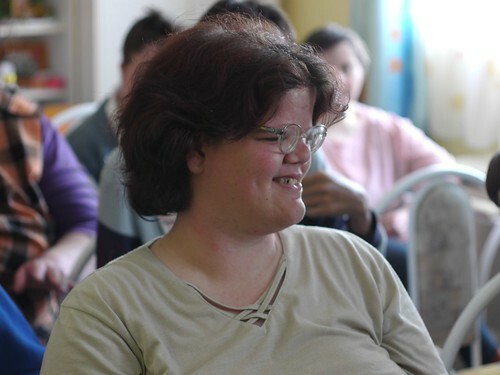 Above: Teammate Erika used to work in Pászto and caught up with one of the teens before the show. 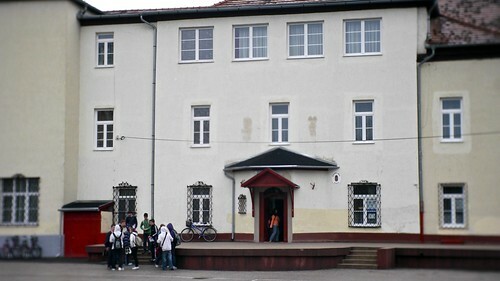 This school is for kids with various learning or mental disabilities. 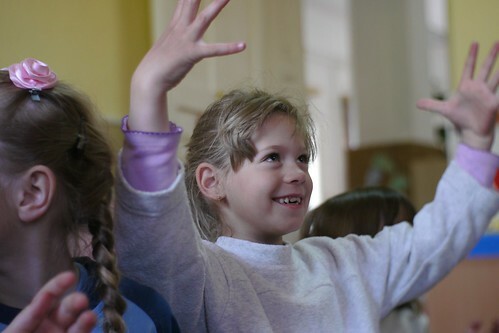 Above: Such a joy seeing these kids sing with such excitement. Praise God for giving us success in these three schools today. In each school we were received with great kindness and I continue to see God at work when Miki begins teaching the gospel after the show. Even though it was clear that a storm was rolling into our area, God was gracious to hold off the rain until we completed our last show. Rain would have caused some of the equipment to be soaked as we had to make a lengthy trip to bring it from our vehicle into Pásto’s school. 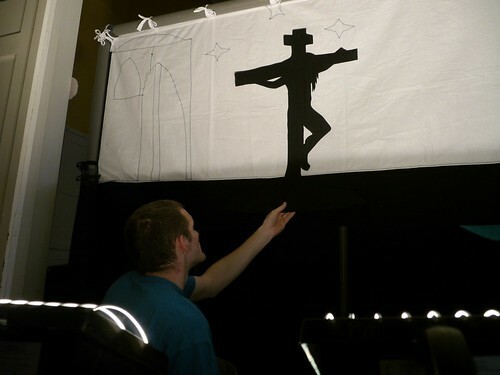 We are nearing the end of Easter’s puppet ministry with only Friday and Saturday left. We appreciate your continued prayers! 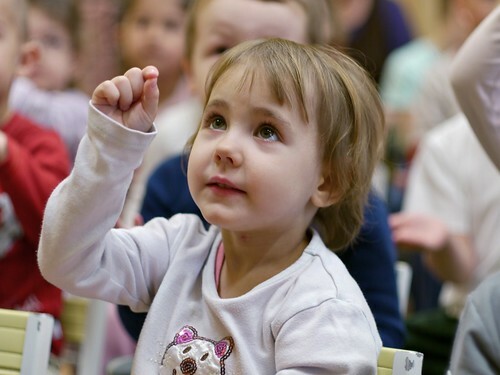 • Miki’s daughter Anna was able to see a doctor about her foot infection and has received medication. She was able to return to school today but still needs prayer for complete healing. • Roger’s daughter Emily is getting better but still needs prayer. Roger’s wife Heidi came down with a cold tonight. Please pray for them. • Peti and Eszti’s washer is still broken down with no clear solution in sight. Please pray for this family with four children! • Please continue to pray for protection for our families and that we would all get the rest we need tonight. 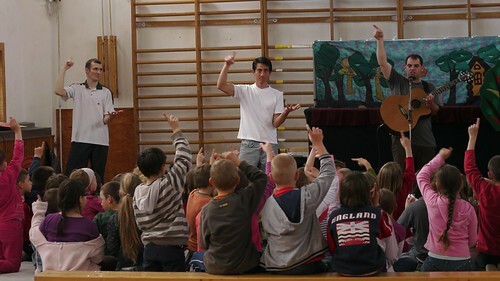 Above: Today our first show was in our hometown of PetÅ‘fibánya. 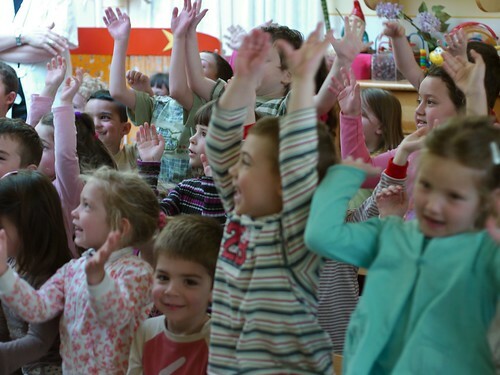 All of our children have attended this preschool (and Kira still attends). 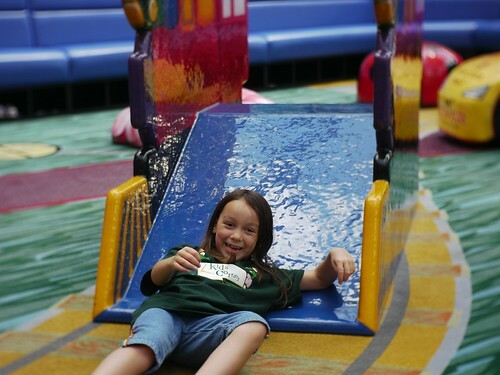 Kira was glad to see some of her friends since she has been out of preschool because of her broken collar bone. 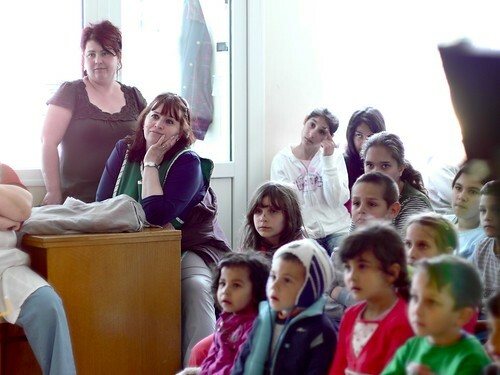 It was cute to see her sharing with all the kids what happened in Hungarian. As Miki walked in the door many kids began shouting out “Miki bácsi” (Uncle Miki). 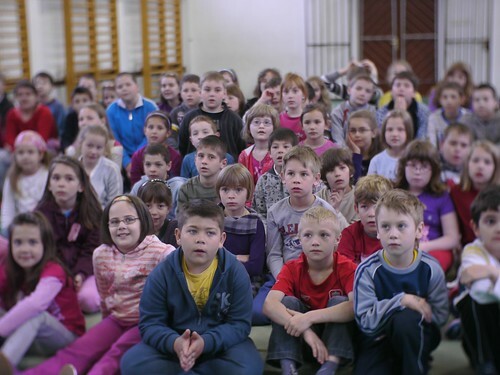 Many of these kids attend his weekly Bible class. Praise God for many open doors in our hometown to share the gospel! One of the teachers after show told us how great the show was. She shared how it not only delivered a message to the kids in an understandable way but also spoke to her. 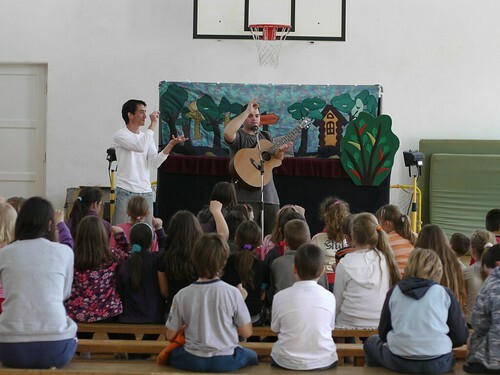 For many years, Zagyvaszántó did not allow us to perform in their local school which led us to use the towns local community center after school for shows. A few years ago when we successfully scheduled a show for their school for the first time, we were turned away because there was a mix up on their schedule. Praise God that over the past year and half we finally have access to this school and today was the third time we have performed for these kids. 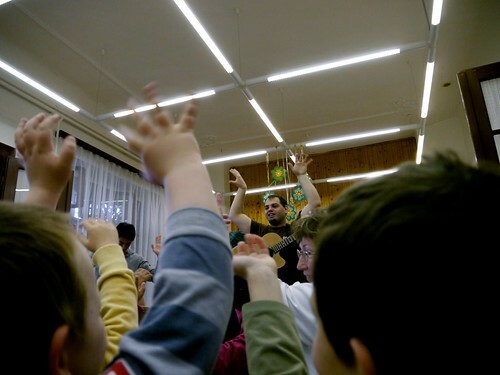 Above: Since this small town is so close to PetÅ‘fibánya many kids like Luca (above raising hand) from PetÅ‘fibánya attend. Luca is a regular attender to our VBS every summer. Above: Singing “On the third day he rose!” After the show, one girl told us that she listens to the CD that we distributed last time and she told Miki the details of what was on the CD! 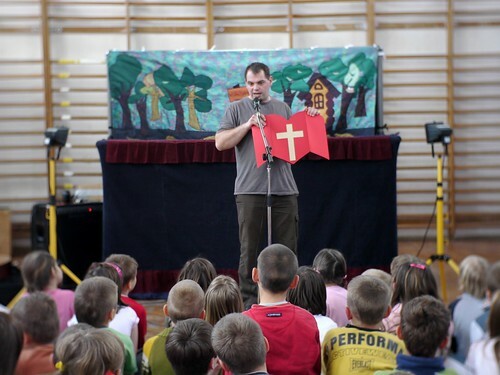 Praise God that these kids not only have an opportunity to hear God’s truth through these puppet shows twice a year, but as many times as they want with the CD. 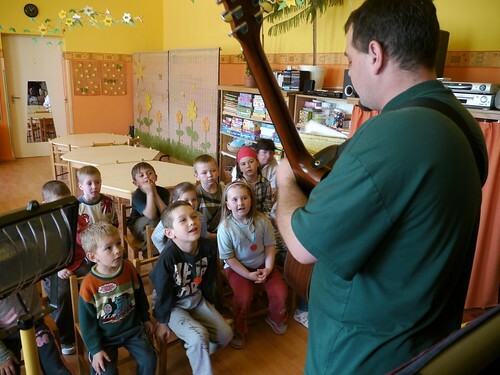 We are encouraged that God has opened this door in Zagyvaszántó! Thank you all for your continued prayer support. 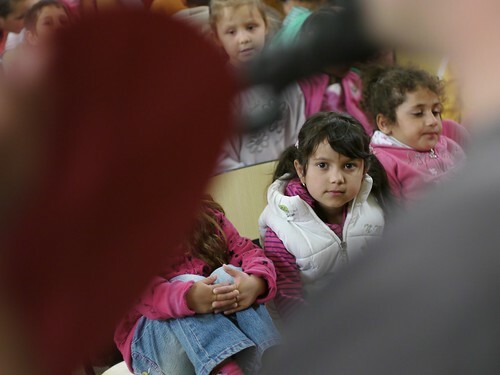 Today I noticed that the kids in both places were quiet and attentive when Miki pulled out the large cut out heart and began talking about John 3:16 and the resurrection of Jesus Christ. 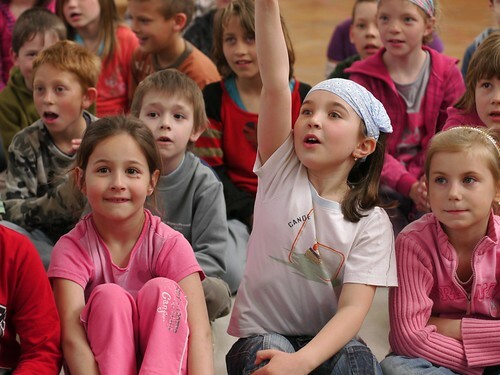 This is not the norm especially in larger schools like Zagyvaszántó where kids find it more difficult to pay attention. I attribute this to God answering your prayers. 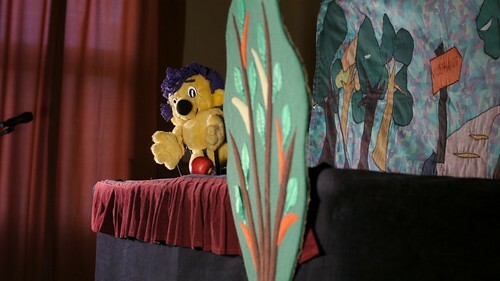 We have three more days of puppet ministry ahead of us and would appreciate your continued prayers! 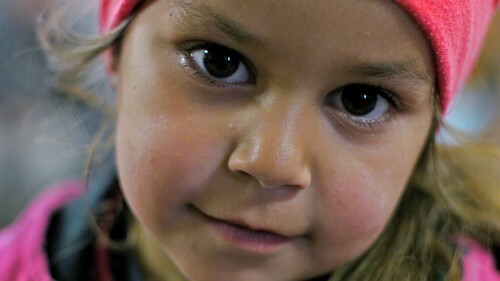 • Please pray for Miki’s daughter Anna who has an irritated spot on her foot that is showing signs of possible more serious infection. • Please continue to pray for Kira (healing collar bone) and Emily’s sickness. 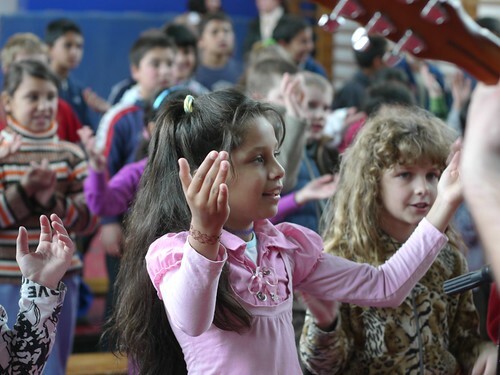 • Please pray for the kids who have already received the CDs and magazines over the past week and a half to be blessed at hearing God’s truth. Pray that God draw them and their parents to Himself. 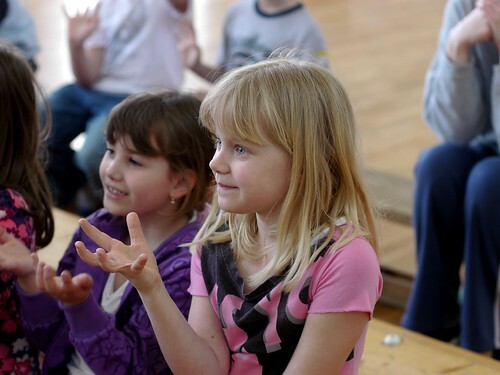 • Please pray for our teen mentoring meeting thursday night after our puppet show (Miki will be teaching). Above: Miki helping the kids use their imagination as we paint imaginary eggs using our colorful clothing as our palette. 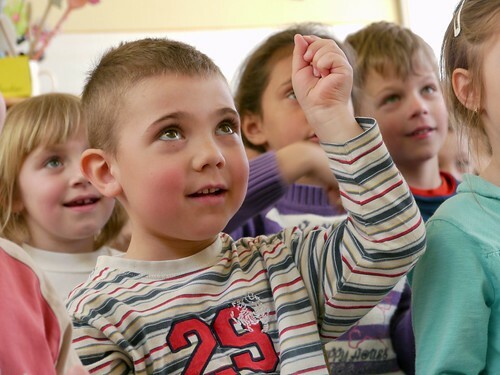 This is a great way to begin interacting with the kids before Miki asks the question, “But you know Easter isn’t just about painting eggs...”. Miki then talks about the death of Jesus and His resurrection from the dead on the third day. 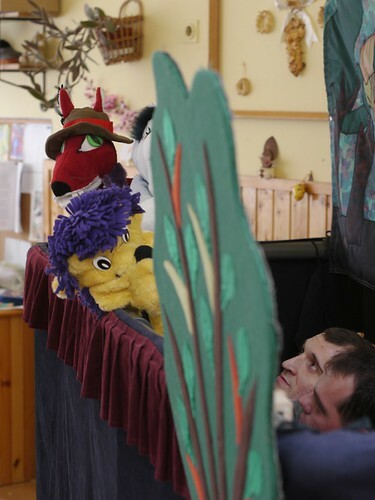 Above: The puppet show really captured the kids attention! 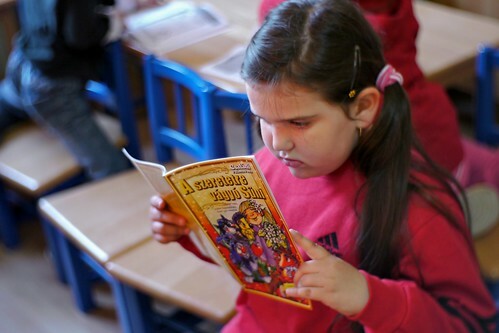 Above: Our second destination today was Hatvan’s Special Needs Center. We have been coming here so long that most of the young adults know us by name. We love to hear their laughter and see their excitement throughout the show. 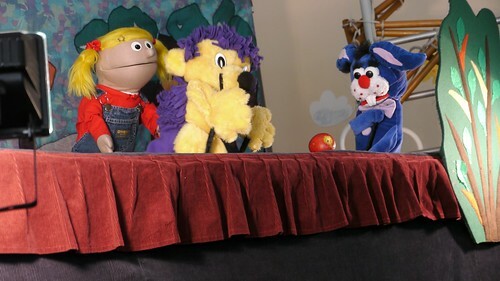 Praise God for his constant help throughout these past seven days of puppet ministry. All of our equipment has worked with no problems, God has protected us as we travel and He is planting seeds in these kids’ hearts that we hope will take root and transform a new generation for HIs glory. Praise God that Allen’s wrist and arm’s swelling has decreased and is definitely looking and feeling better. • Please pray for teammate Peti who’s washing machine broke down a few days ago (he has four kids and his wife is taking on a lot of work washing by hand). • Please continue to pray for Roger’s daughter Emily who has a cold and is having trouble sleeping through the night. • Please pray for a refreshing night’s rest tonight so that our team will be ready for ministry tomorrow. This update is going to be short. I got home late as I caught up with an old friend visiting Budapest from the US after our puppet shows today. Overall, it was a great day with no problems. The team seemed well rested from the weekend and continue to serve with joy. 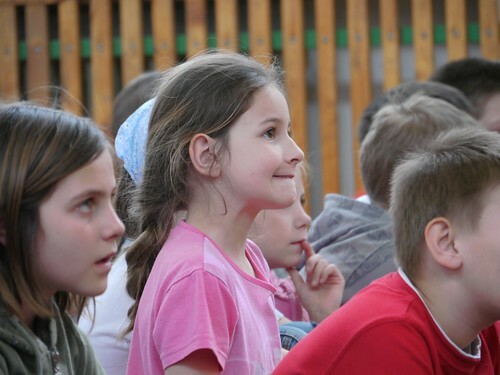 The teachers from the schools we visited today (ErdÅ‘tarcsa, KaÌ�llo, and ErdoÌ‹kuÌˆrt) all commented on how great the show was and how they wait for us to return each year. 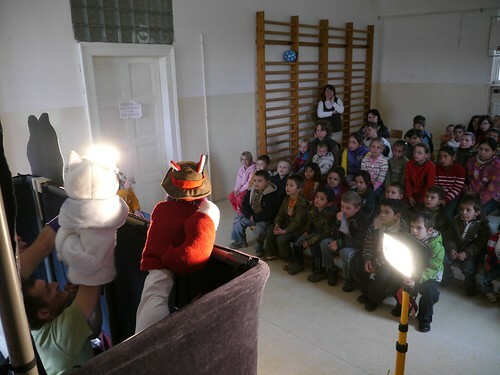 The first school we visited (ErdÅ‘tarcsa pictures below) is one of the schools we have consistently visited over the past six years of doing puppets. 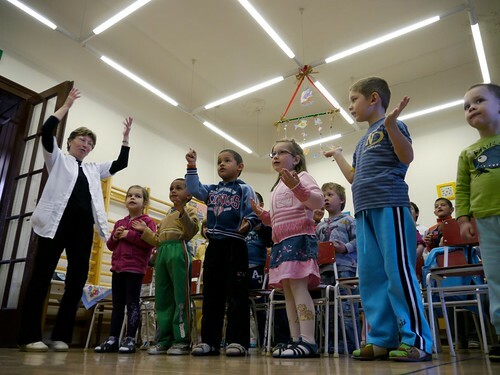 The teachers along with the kids from this school wholeheartedly participate in all the singing and motions. Above: This year’s song has lyrics that simply proclaim the truths of the gospel. Verse 1: He died for me, He suffered in my place, verse 2: On the third day He rose from the dead, Jesus lives today, verse 3: I received new life from Him, I’ve been born again, verse 4: Every knee will bow before Him, His is the glory, verse 5: Say yes and no, say yes to Him and no to sin. 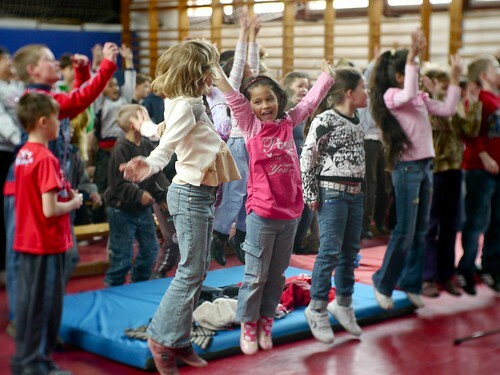 The kids really enjoy singing verse 2 when they get to jump into the air to signify His raising from the dead. How amazing that God has opened a door to proclaim His love through the gospel (even through song) to 18 public schools in our area. Praise God. We appreciate your continued prayer support! This is a battle for the lives of a new generation and we truly need you all to join this battle through prayer. When the apostle Paul talks about the spiritual battle we are engaged in and the “whole armor of God” that we are to put on to stand against the schemes of the devil, he ends by saying, “praying at all times in the Spirit...keep alert with all perseverance, making supplication for all the saints, and also for me, that words may be given to me in opening my mouth boldly to proclaim the mystery of the gospel” Eph 6:18 God has ordained that your prayers be part of this battle, this week! • Please pray for Kira (she is doing great) in this first week of her collar bone healing up. • Please pray for Roger’s daughter Emily who has a cold. • Please pray for Allen who was stung on the wrist on Saturday and continues to deal with swelling and discomfort. 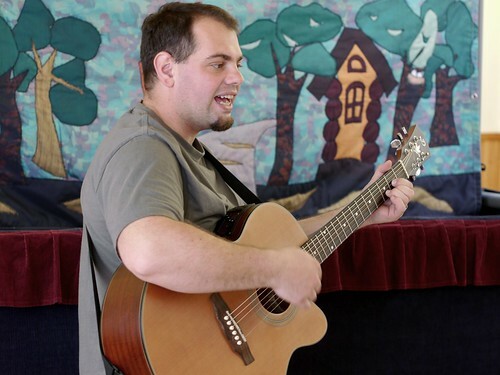 • Please pray for those who will see the show tomorrow, especially for a group of mentally disabled young adults to be blessed by the singing, the show and the teaching tomorrow. • Please continue to pray that our families would be protected in this time and for our little ones to be able to sleep. Above: Bori grabbed us as we walked into the Egyházasdengeleg school and gave us traditional kisses on the right and left cheek. This type of greeting is reserved for close friends and reveals how she has grown closer to us over the past six years we have been doing puppet ministry in her school. Miki has had multiple opportunity to provide evangelistic materials to Bori and continue conversations over email. Before leaving, Miki invited Bori and some of the other teachers to a cook-out at his house later this year. Bori told Miki that it is hard to find a forum to just talk and share what is going on in life. May the Lord continue to draw these teachers to Himself. 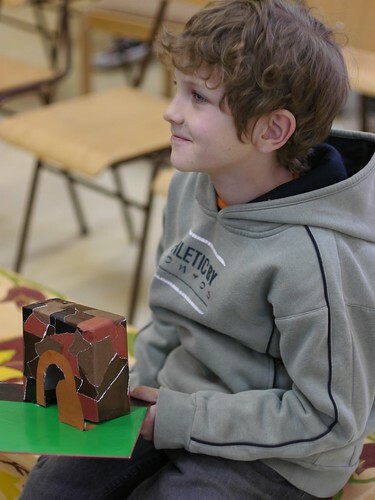 Above: One of the kids kindly prepared an empty tomb gift to give to us at the end of the show. Above: Setting up our stage at Héhalom, our second destination. 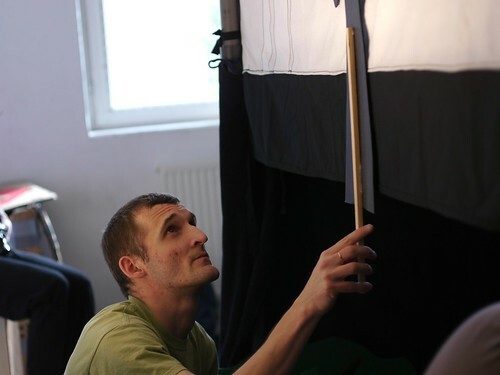 Above: Hugi, once a church member in PetÅ‘fibánya who relocated to Budapest joined us for Friday’s puppet ministry. 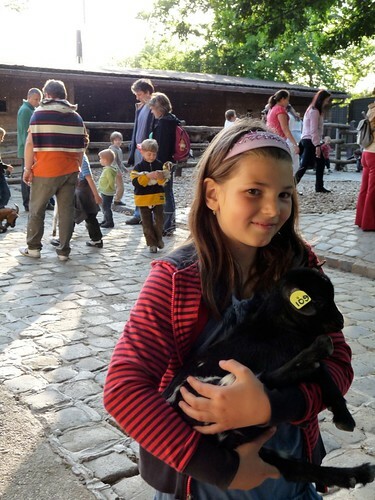 We see how Hugi has grown in her faith throughout the years. 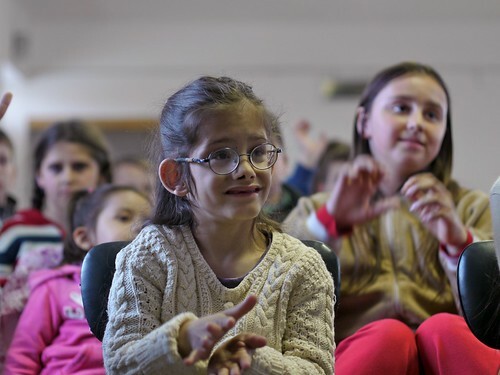 Even though Hugi has limited motion in her one arm because of suffering a stroke years ago, God has opened up many doors where she can bless others in her new home church in Budapest. 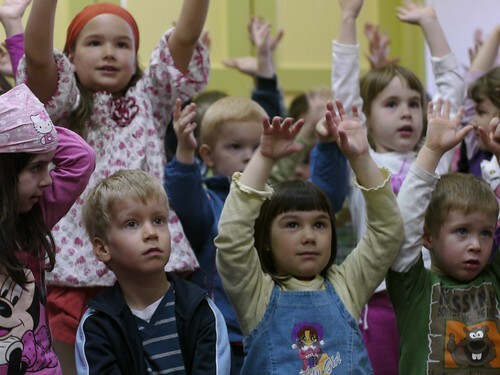 Currently Hugi is completing an extension program on teaching children the Bible. 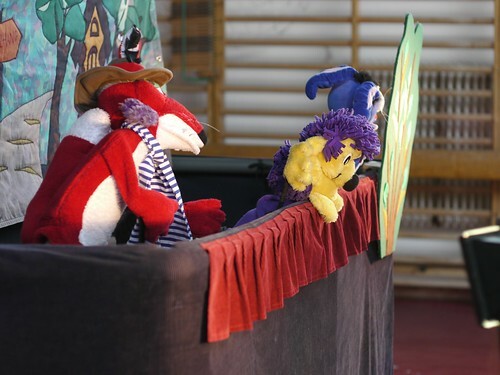 Above: C’mon Peti, we still have two more shows today! 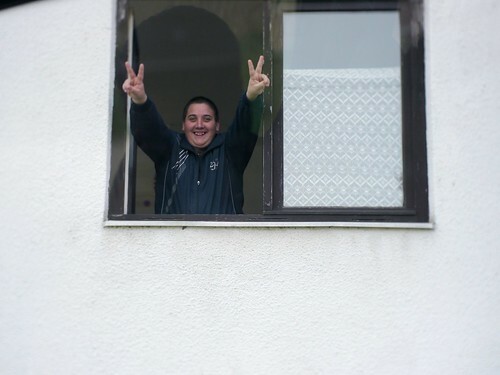 Above: One of the kids giving us a fair-well shout through the school window. 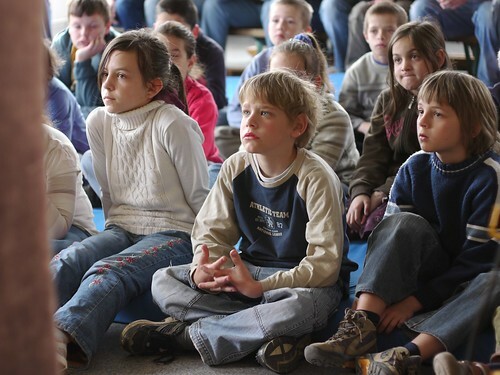 Above: Even the teachers are drawn into the show. 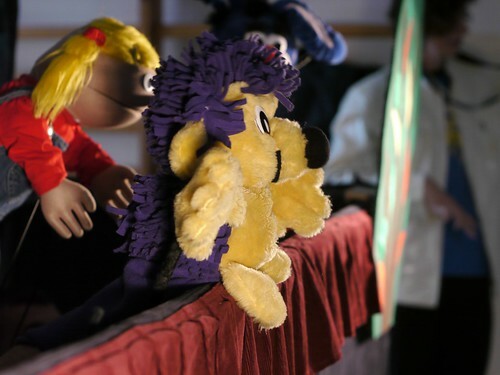 Part of the storyline involves a hedgehog that has trouble accepting the love of others and ends up hurting others with his words and attitude and finally one of his spines. One of the hurt friends initially turns away from the hedgehog but then hears the story of Jesus Christ’s death for our sins and resurrection from the dead. In the scene when Jesus is dying on the cross, the narrator highlights the account of Jesus praying for his enemies. This friend then turns back to find the hedgehog and begins loving him as Christ loved us. This gives Miki an opportunity after the show to talk about the Gospel and the affects of the God’s love which transforms the way we live in relationships. 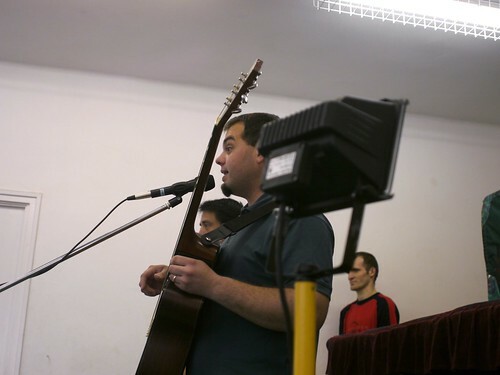 As Miki was sharing the Gospel in Szirák at the end of the show, he was reciting John 3:16. We were thankful to hear many in the audience begin shouting out the verse with him from memory. 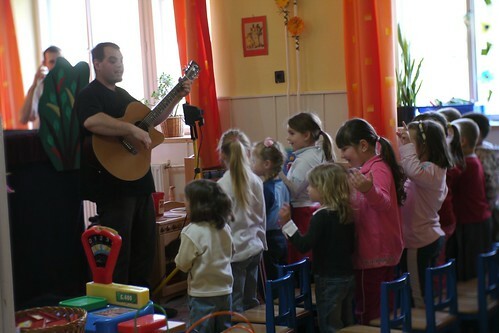 I’m not sure if this is from local teaching that they are receiving or from hearing the CDs that we distribute every year. In any case, it is great! 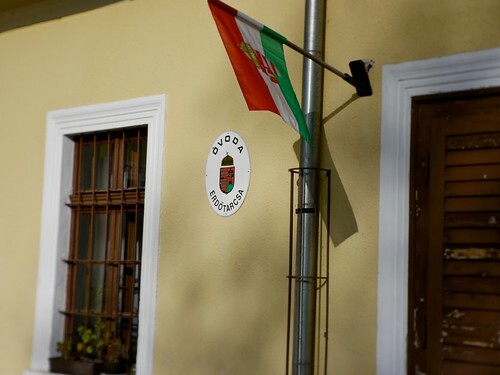 Above: Our final destination for Friday was our hometown of PetÅ‘fibánya. 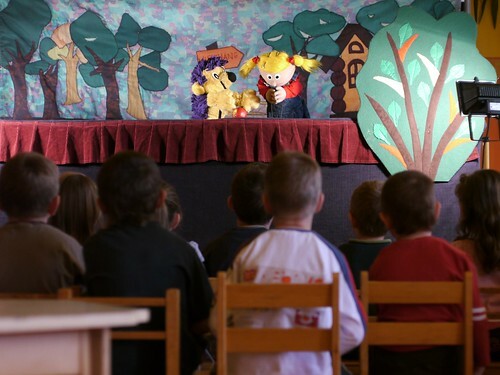 For years past, this has been one of the worst behaved schools and we often encounter the most difficulty when sharing the gospel after the puppet show because of kids chattering and the lack of help from teachers to keep the kids in order during the show. This year was completely different! 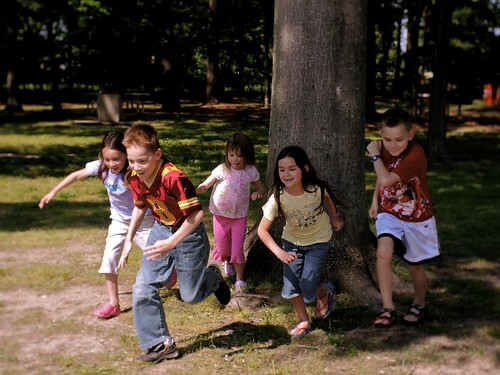 The kids who came had to have permission from their parents, so it wasn’t an extremely large group. 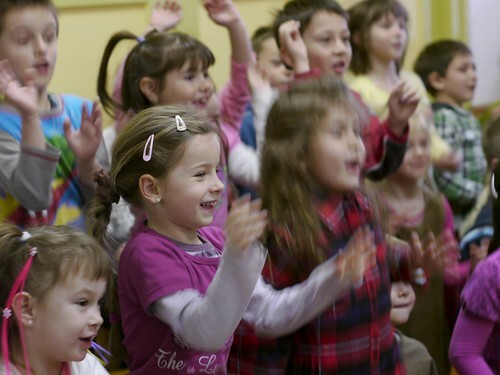 But even without a teacher present, the kids payed attention throughout the show and had no need of any form of correction. 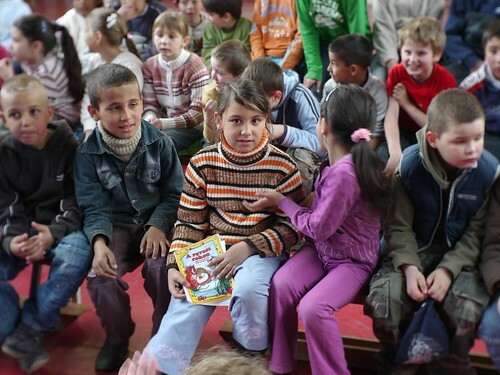 Most of these kids regularly attend Miki’s Bible classes in school (held once a week). 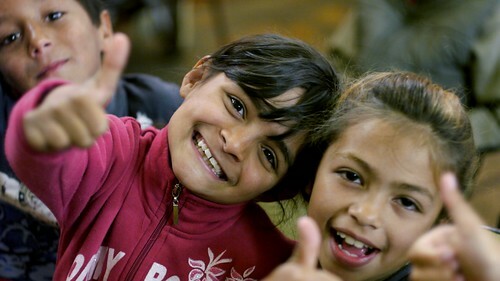 Praise God for bringing transformation to Petfiábanya! Above: Our friend Edina who used to attend our English Bible studies brought her son to the show. Above: Last night at 2:00 in the morning we heard a thump in the night, then crying. Initially we thought Kira had fallen out of bed (which only happened once before in her life). It turns out that on her way to the bathroom, which is right next to her room, she somehow slipped and fell. 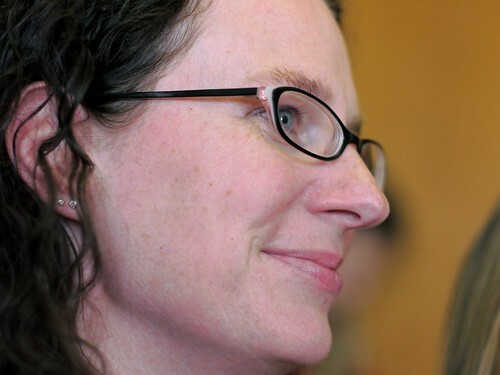 It was clear that the pain she was experiencing was not subsiding. 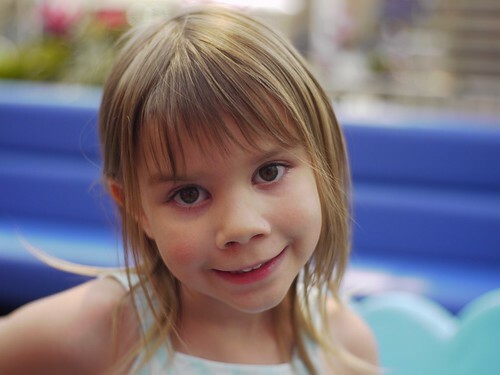 Praise God that she was able to get back to sleep after helping her back into bed, but the signs the next morning pointed to a possible muscle strain or broken bone. After today’s puppet shows, we were off to Budapest for x-rays. 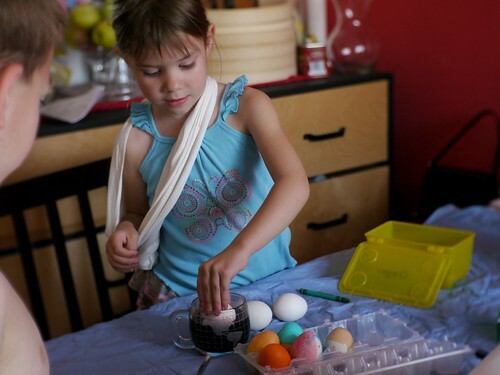 Above: Minutes after the x-ray, the specialist said, “Yep, it’s broken.” This type of break is common in kids Kira’s age and after wearing a sling for 3-4 weeks, the bone should fuse back together with no problems. Praise God for helping her get back to sleep and for the ability to see a doctor on Friday! • Although each of the guys (Miki, Allen and Roger) seem to be improving with their sinus sickness we would appreciate continued prayer. • Unfortunately, Roger’s daughter Emily continues to wake up multiple times a night having trouble sleeping. Please continue to pray for us and our families that we would be able to sleep through the night in this time of evangelistic ministry. • Kira seems pretty content with her sling and thankfully not in constant pain. Please pray for healing of her collar bone, and for protection for her in this time of healing. • Sharon is experiencing sinus cold symptoms. Please pray for healing. 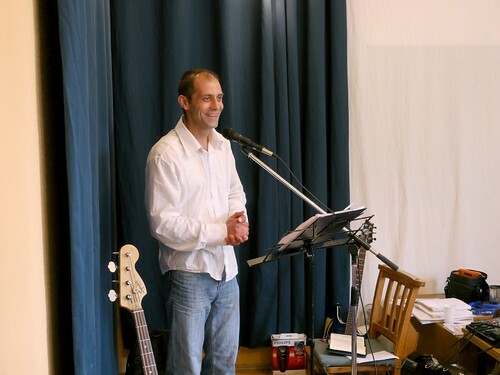 • Allen will be leading Worship Service on Sunday, please pray for wisdom and for the church to be built up in Christ. Above: After meeting for morning prayer in PetÅ‘ifbánya, we headed off to Selyp to pick up Peti. 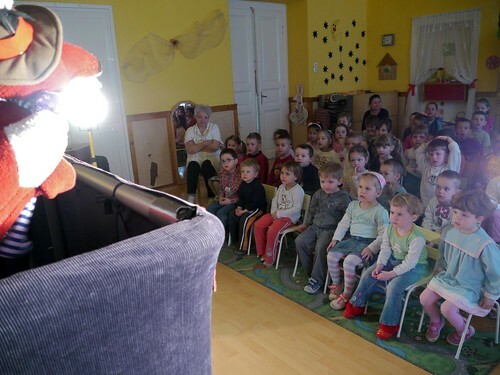 One of Peti’s daughters, Alina would be one of the many kids viewing our Easter Puppet show this morning in Selyp’s preschool. Above: We were thankful for the warm reception and one teacher in particular who helped the kids in the end answer the question about what Easter was about: “That Jesus died for our sins and was raised on the third day.” We have only been attending this preschool for a few years and it is clear the kids are understanding more each year. Above: Soon after we finished our first show, we were informed that our next destination LÅ‘rinci, had no power! 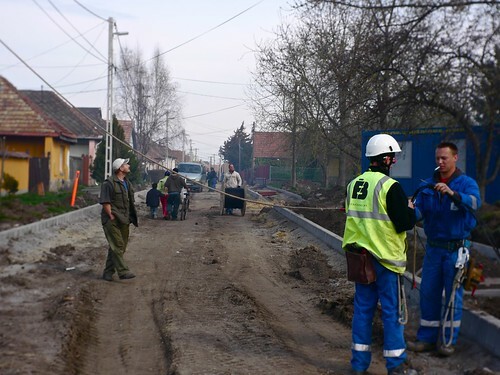 As you can see above, the preschool was getting new wiring in the midst of road construction. Ironically, this same school last year had a power outage on the day we planned to come. 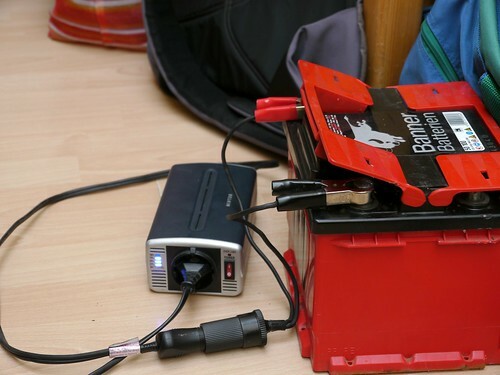 God led us to a solution involving a power generator that would run from a car battery. We dropped Miki off in Petfibánya so that he could remove his car battery and we headed the opposite direction to another church members house to grab the power generator. After this crazy turn of events, we still were able to arrive a few minutes late and with all the tools we needed for the show! 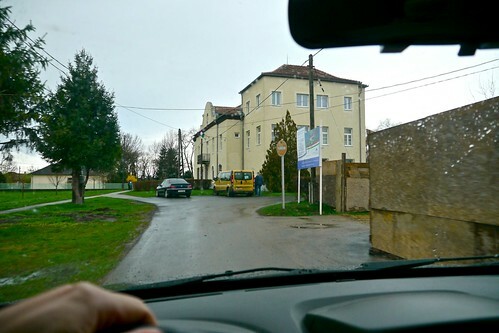 We even (miraculously) were able to drive right up to the front of the school even though the roads littered with a bulldozer, a crane and dump trucks. One of the teachers told us she was amazed that we were able to park out front since none of the teacher’s cars were ever allowed on the street while construction was going on. Praise God for allowing the show to go on! Above: How we powered the show. 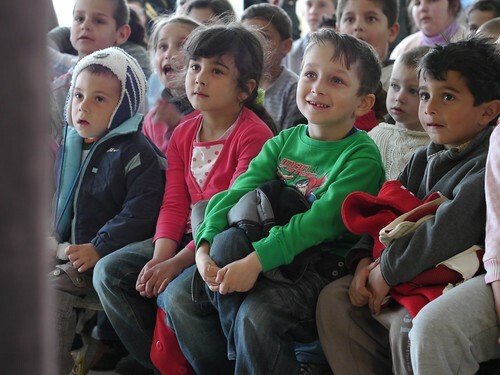 We are thankful that we were able to perform in LÅ‘rinci and Selyp’s preschools today. 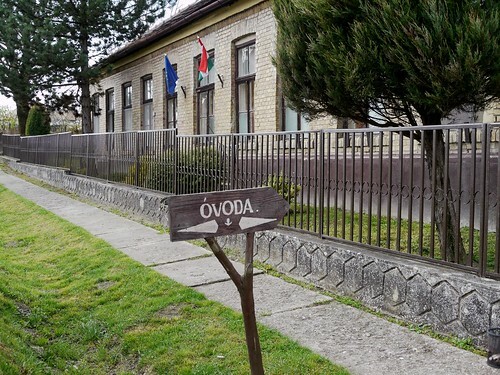 Both of these towns neighbor PetÅ‘fibánya and we have multiple opportunities throughout the year through community events and our summer VBS to continue reaching out. Unfortunately, the middles schools in these towns, which kindly refused our CD/magazine gifts last year, did not invite our team back this year to perform. 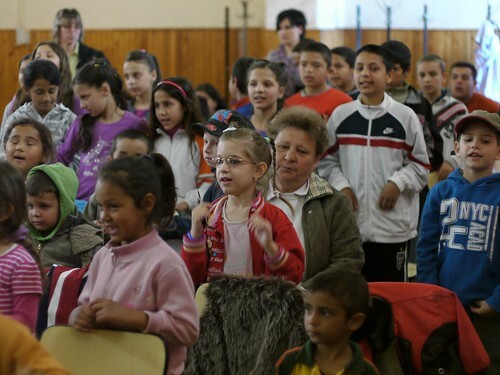 From what we can gather, some parents associated with a political movement in Hungary that blames Jews for many of the countries problems found out that the non-profit organization that supplies the evangelistic materials supports the equal treatment of Jews. They complained about our performances and materials and the door was closed. This is a scary political movement that is spreading hatred toward various people groups. Please pray for the people of LÅ‘rinci and Selyp! 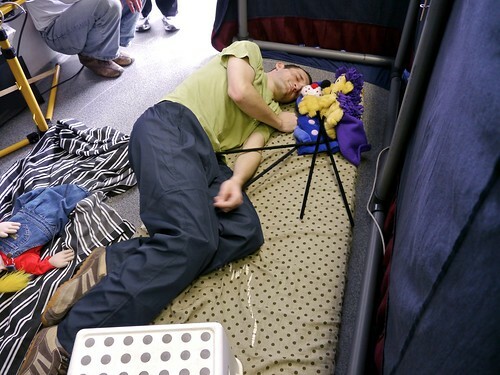 • Tomorrow we have a tougher schedule and because of sickness and lack of sleep the team is a bit worn out. Please pray that God would refresh us tonight as we all rest and bring healing to our bodies (Miki, Roger and Allen). • Roger’s daughter Emily is still having trouble sleeping through the night which disrupts their families sleep. Please pray that God give a peaceful night’s rest. • Tonight we’ll be meeting with teens for mentoring. Please pray for encouraging fellowship and God’s truth to bring these teens to maturity. 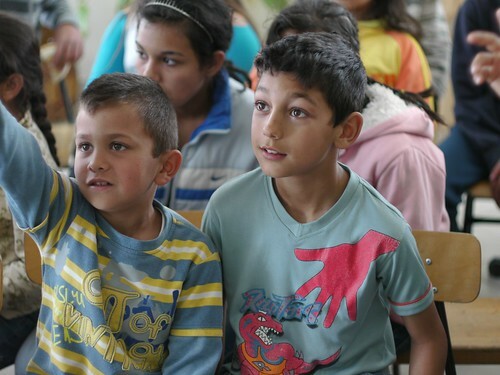 Above: Today, we had a lighter schedule with just one school to visit in the larger town of GyoÌˆngyoÌˆsoroszi. We were thankful for a János (above talking with Miki), a friend from PetÅ‘fibánya who joined us today. As some of you know János is the husband of Timi who has been coming to volleyball. They have joined us on a few occasions for dinner and conversation and God has opened the door for sharing the gospel with them. Today’s car ride with János led to some discussion about shifting our trust in men to trust in God. We also were able to talk about what it means to believe in Jesus and the changes that God begins to work in us as he sanctifies us through His Spirit. 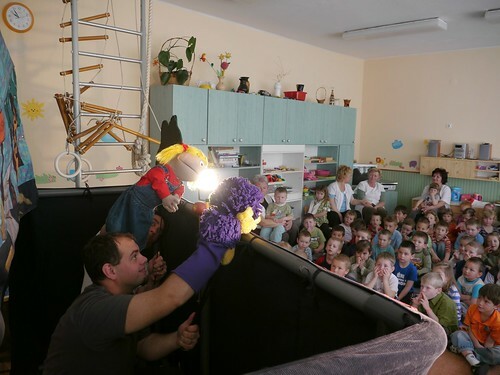 Praise God for the gospel being shared not only to kids through this puppet ministry but also with János! 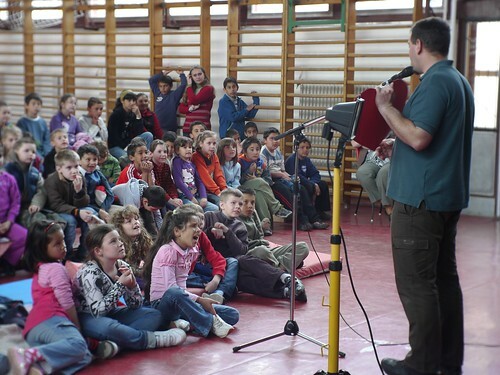 Above: Being a larger auditorium with close to 200 kids from preschool to middle school attending, the noise level was a bit hard to keep down during the time Miki shared the gospel. 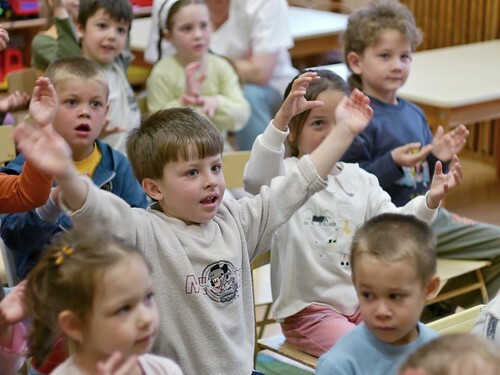 Above: Even with the noise and chatter, it was clear that the smaller kids were engaged with the message and paying attention. • Please continue to pray for Miki, Roger and Allen (sinus/cold). 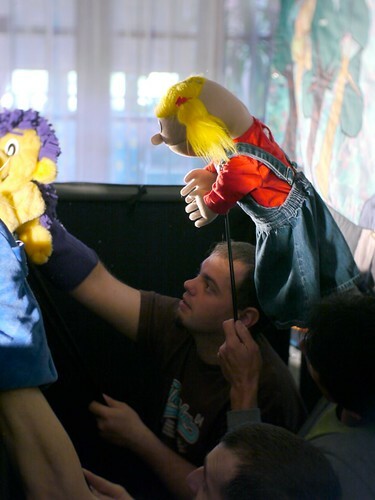 • Please continue to pray for Roger’s daughter Emily who is waking up crying (just started when we started puppets). 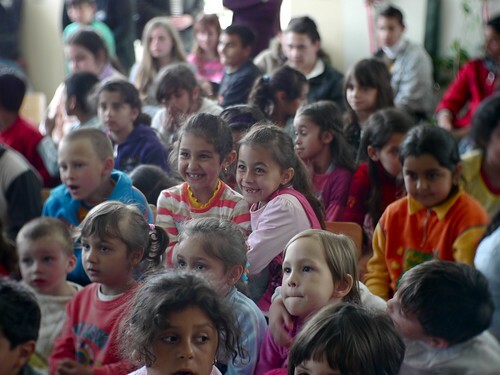 Please pray for protection for all of our children, freedom from fear and for peaceful nights of rest for them and for the team. 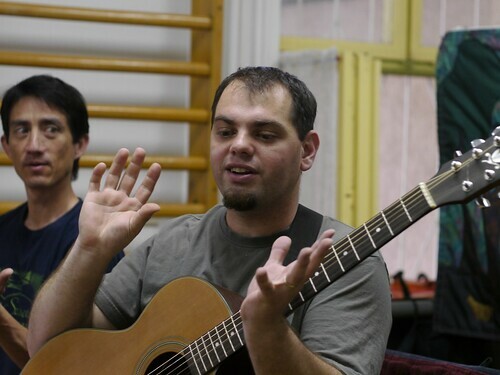 • Please pray for János and his family to come to personally put their trust in Jesus Christ as Savior and Lord. Above: Driving up to Heréd’s public school for today’s Easter Puppet Ministry. Above: Kids helping set up the gym for the show. Over the past year we have seen God at work in Heréd. Most of you know that a woman named Marcsi from Heréd called our team asking if we could hold discussions about our faith with the community. Marcsi is not a believer but has gone out of her way to organize events where we can share the truth of God’s word in her small town. God is drawing people to Himself and it is our hope that the seeds we plant in these towns will grow by His grace. 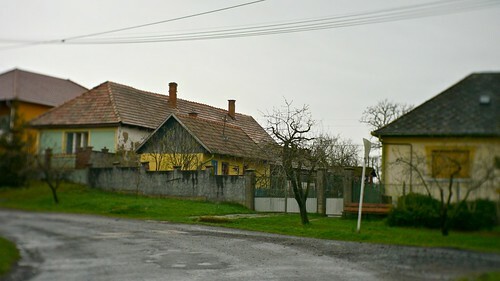 Above: Ákos. 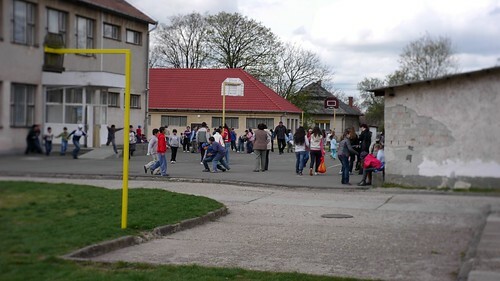 As we were unpacking and the kids began marching into the large gym in Heréd, a young boy named Ákos approached me. I grabbed his shoulder with a smile and asked if he remembered us. Ákos, also smiling said, “You guys have been doing this for so long. 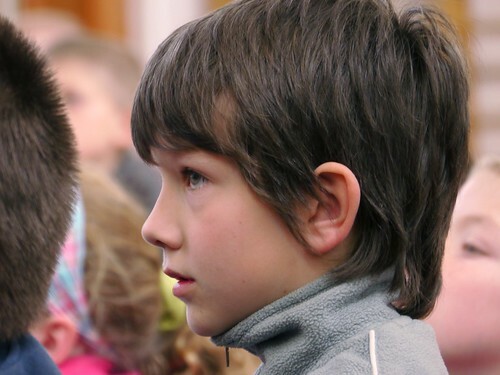 I remember when I first saw you in preschool, then in middle school in Selyp and now here in Heréd.” I asked Ákos what his thoughts were about God and he said that he believed. 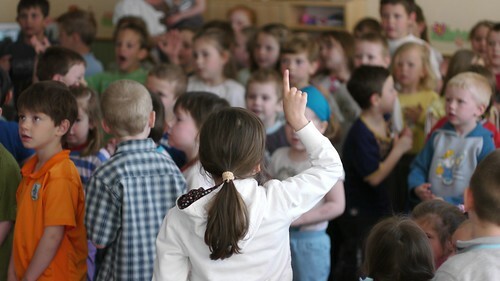 When I asked if he had much opportunity at home to talk about God with his family he lowered his head and said, “No, not really.” Sadly, the majority of these kids would most likely give the same answer. 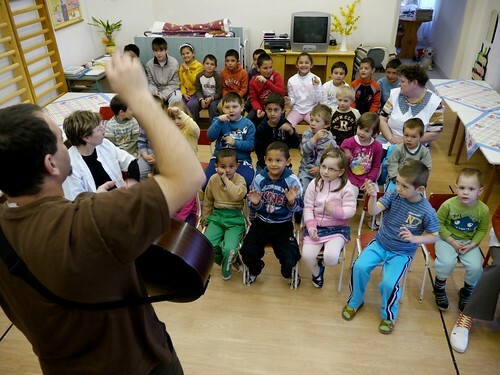 It has been our experience in PetÅ‘fibánya that the great majority of our body is composed of first generation Christians who had no support or fellow believers in their family. 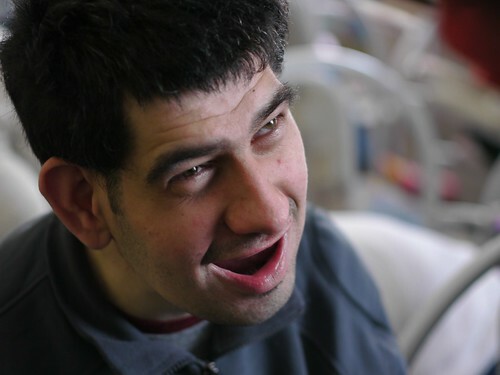 Because of the new open doors in Heréd, we will most likely have an opportunity to meet Ákos again. 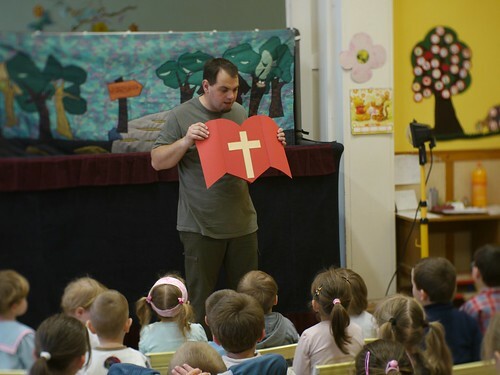 After the show in Heréd, Miki overheard some of the teachers saying that the show really made clear the true message of Easter. 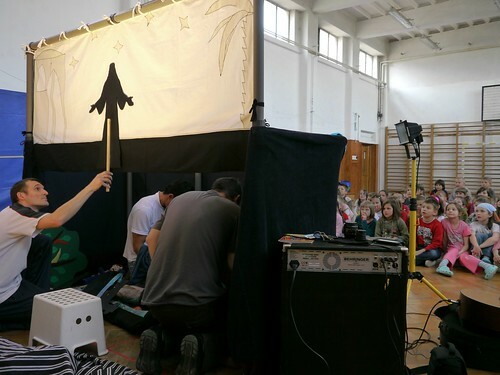 Praise God for the team in Budapest that designs these puppet shows and equips teams like ours to take the message of Jesus Christ’s death for our sins and resurrection from the dead to public schools throughout Hungary. 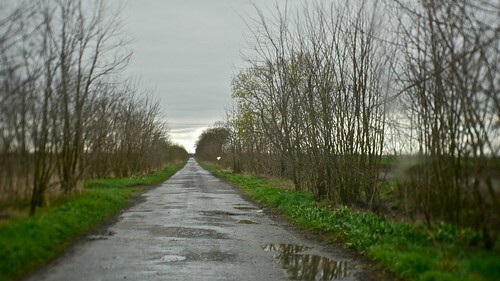 Above: This road from Heréd to Nagykökényes ended up being an obstacle course with deep potholes as the road showed severe wear and tear from the previous winter months. 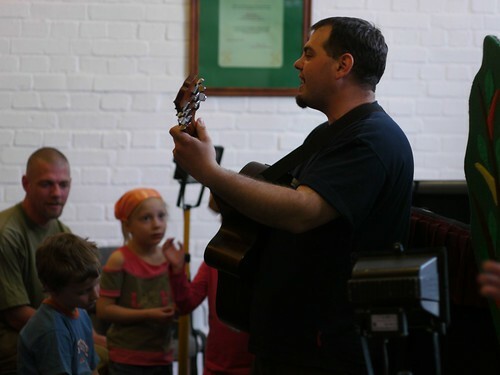 Above: After painting some imaginary eggs with the kids, Miki teaches the kids this year’s song which goes through a progression of singing gospel truths. 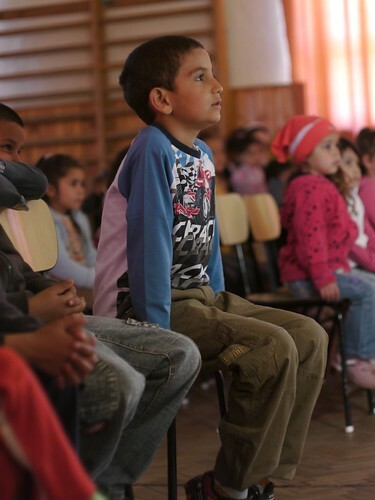 Above: Over the past two days we have noticed that the kids are paying attention to Miki as he presents the gospel. This is not always the case every year and we often encounter distractions and a rising level of talking when the time for this important teaching comes. 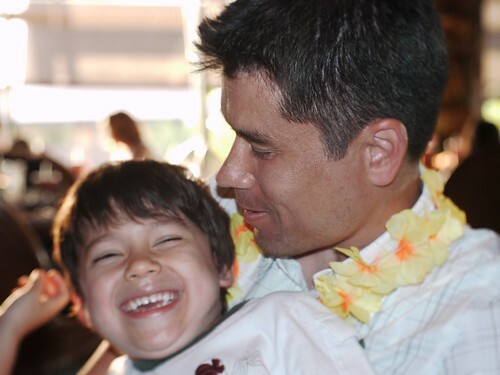 Please continue to pray for the most important part of our show where MIki shares the gospel. • Please pray for Miki, Roger and Allen who are suffering from the remnants of a cold (sinus infection). • Please pray for Roger’s daughter Emily who had trouble sleeping last night. 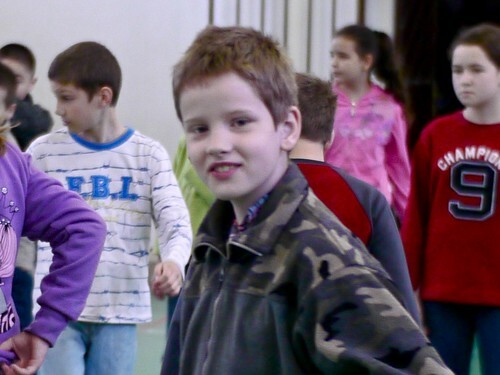 • Pray for Ákos, the young boy we met in Heréd. Pray that when we return to Heréd for other outreaches that we would meet again. Above: With the generous gifts of a few supporters (thanks! 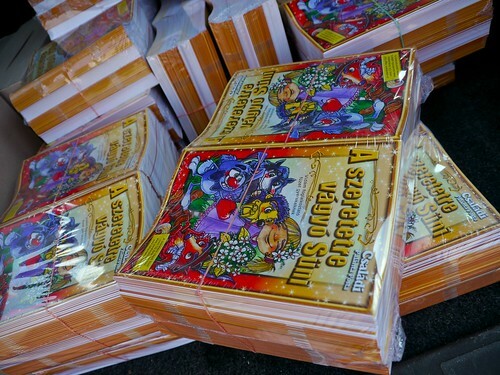 ), we were able to purchase 1,800 evangelistic packets to distribute over the next two weeks. Praise God there were no issues going into town to pick up the materials. 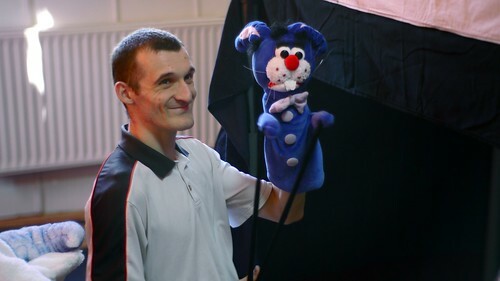 Above: Church member Peti who was saved a few years ago is excited to be joining us as a puppeteer for the first time. Peti has a full time job at a factory and was able to ask for a schedule that accommodated this Easter outreach. We are very thankful for him! Above: The kids were quick to inform us at our arrival that they remembered us. When asked if they listened to the CD from Christmas, many shouted out “igen (yes)”. What an open door! We not only are able to share the gospel every Christmas and Easter, but the families get to hear the gospel over and over again on the CDs that are distributed. 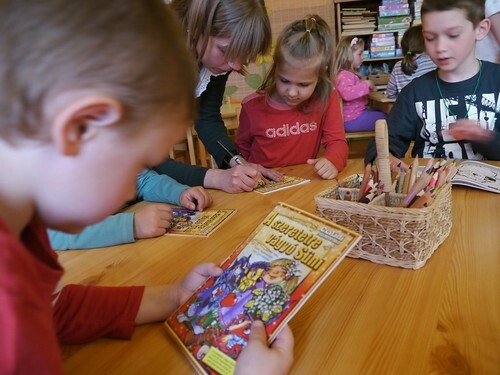 Above: In addition to the children’s evangelistic packets, we have special evangelistic materials for the teachers. Above: Praise God for the beautiful warm weather as we pack and unpack for each show. Everything worked great today. Although we had a suitcase burst open and our lights come crashing out, only one bulb was broken. Miki was able to replace it in a few minutes with no problems. God also reminded me this morning about a cable that we forgot to pack last night. Without it, we would have had no sound for the show! Praise God for reminding me. 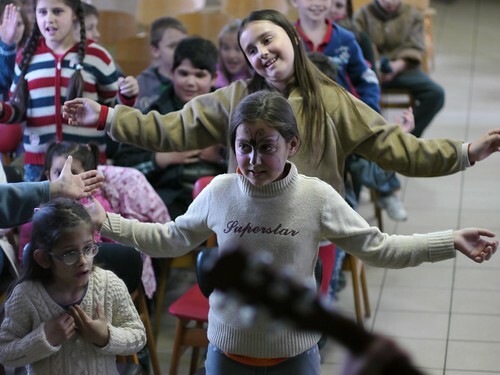 As we left Bér, the kids in the room continued to sing (on their own initiative), “On the third day He rose” over and over again. Praise God that the message of God’s Son Jesus is being proclaimed through this ministry. Thank you all for your continued prayers and support! Paul said it best in Acts 17: 26-27 “And he made from one man every nation of mankind to live on all the face of the earth, having determined allotted periods and the boundaries of their dwelling place, that they should seek God, in the hope that they might feel their way toward him and find him.” Praise God for HIs grace in sovereignly designing life that we might “find him”. 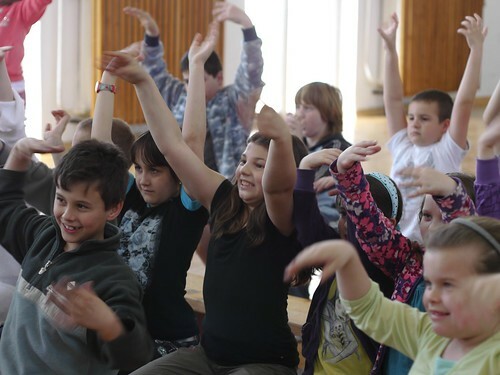 Above: Kira participated in a contest in PetÅ‘fibánya where participants recited poems and stories from memory. She did a great job. Above: Val and Tina offered to watch our kids on Saturday. 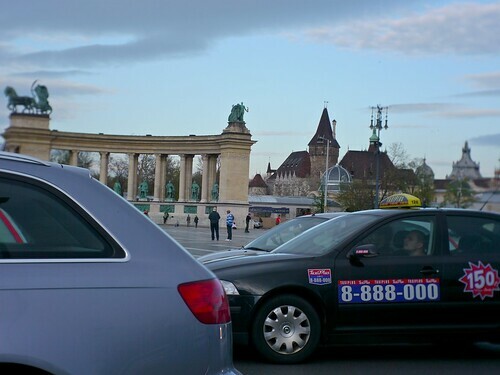 Sharon and I were able to have a date in Budapest (a rare occasion these days). Sharon still looks as young as the day I married her (glad she’s mine). 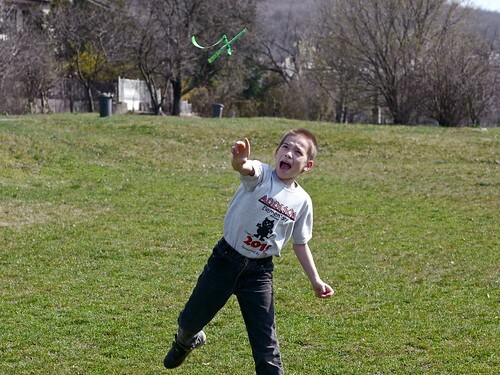 Above: Ben using all his might to throw his plastic airplane. Praise God that he is fully recovered from being sick over the past few weeks. 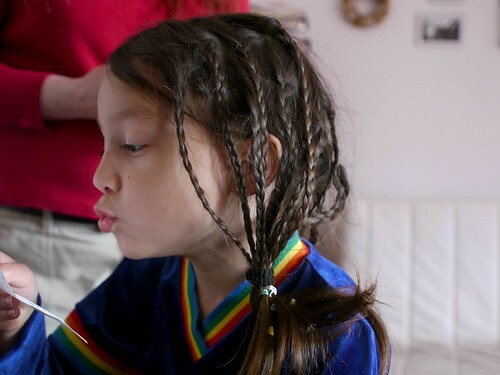 Above: Ellie enjoying her braided hair (thanks Tina). 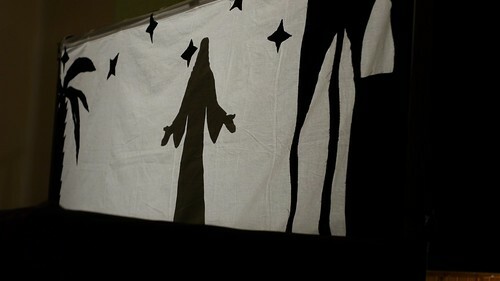 Please continue to pray for us as we continue our Easter Puppet Ministry tomorrow.